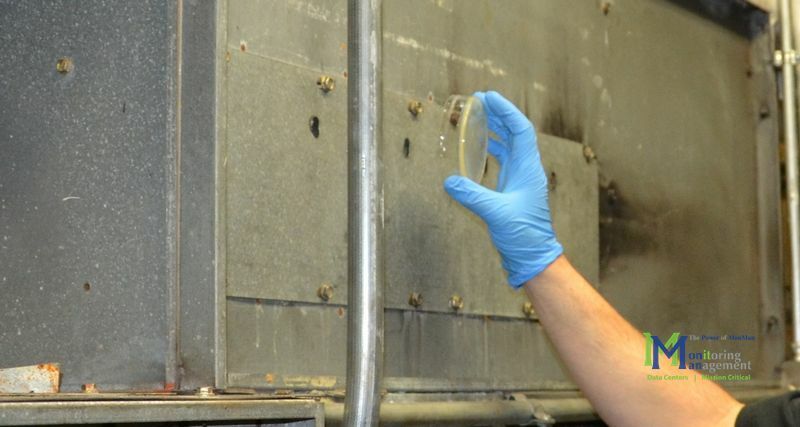 In the image above, a sample is taken from a rusted hole in the air handling unit. High velocity air and water were leaking out of the air handling unit at this location. This sample point is after the filters, meaning any contaminants at this point in the unit could easily make their way into the operating room. I should have known they’d be on high alert, but I wasn’t expecting to be treated like a walking biohazard when I went for my yearly physical. Sure, we all figured the recent Ebola outbreak would change the way the healthcare industry handles infectious diseases, but I had no idea it would hit so close to home. What? West Africa? I hadn’t even been out of town! It was coming up on Flu season, and though my checkup had to be scheduled a few weeks in advance because of a patient backlog, I honestly considered walking out of the doctor’s office and waiting until the whole thing blew over. As I was mulling it over in my head, the nurse jolted me back to reality when she called my name. She took the usual notes: height, weight, blood pressure. She asked the usual questions: has your information changed? Are you still a non-smoker? I wasn’t expecting much more from a yearly checkup. “Do you have a fever, chills or are you vomiting?” she asked. “Um, no, this is my regular checkup.” I replied. “Sorry, just a new set of questions we’re required to ask,” she assured me. I thought to myself: “21 days… 21 days…” Finally I had one of those ‘Ah-Ha!’ moments. 21 Days. That’s the incubation time for Ebola that’s been all over the news. Confident I wasn’t secretly treating Ebola patients in my spare time, the nurse finished and I was left alone to wait on the doctor. As I waited, I gazed around the clean, bright room. Blood pressure cuff, swabs, gauze. I looked up. Bright lights and ceiling, an air conditioning vent. Hmmm, I thought to myself, "I wonder what kind of germs are coming out of that vent?" Despite the headline, this article isn’t about Ebola. It’s not even about the flu, although the 2014-2015 flu season is turning out to be worse than predicted. I’m not even talking about the CDC, the doctors, nurses or the patients. This is about the silent killers that don’t get the headlines. The things most of us don’t even know exist. This is about the nasties hiding in the darkest corners of hospitals. I found it interesting that at the time, there was only 1 confirmed Ebola death in the United States, a man who was infected in West Africa and arrived in the U.S. already in terrible condition, yet we were collectively 'freaking out' about Ebola. A few voices of reason in the crowd reminded us that far more people die from the flu each year than Ebola. It made sense to me. But if that were true, what about other diseases? True, dying from Ebola or the flu is a scary thought, but compared to other diseases, deaths from those two are actually quite rare. Where does the real danger lie? In the image above, discharge air (positive pressure) leaking out of several holes in ductwork is collected with a Petri dish. This procedure was duplicated on the return air side (negative pressure) from inside the return ductwork. Part of my job keeps me up to date in the HVAC industry, especially in the healthcare market. I’ve crawled my way through some dark, dirty places in hospitals; places the patients and the doctors don’t even know exist. I replace old air handlers. You know, the big metal boxes that heat, cool and filter the air in hospitals? You've probably never thought about them and I can't blame you; they're usually up on the roof or hidden down in a basement somewhere. In a sense, they're the lifeblood of the hospital. They usually work well, chugging along in corner closets and basements, away from patients and doctors. When they stop working, things can go wrong, and fast. But that's a rare occurrence since facilities and maintenance personnel do a good job of keeping the motors well-lubed and the filters changed. I don't work for the CDC and I’ve never “scrubbed in” to a sterile field to perform a surgery, but I know a thing or two about air conditioning systems in hospitals. And from what I had seen in the past, I needed to know more. What we found was amazing. While we knew getting some really colorful mold growing in a Petri dish would get a lot of attention, it would be far too easy. I've seen hospital air conditioners with rusted out bases, holes big enough to fit your fist through, visible mold growing inside and out, and more. The oddest thing I've seen so far is an air handler that had its bottom rusted out, so it was replaced with plywood. If you know anything about air conditioners, you know they can get hot, cold, wet and dark. Perfect breeding grounds for all sorts of nasty bugs. But taking samples at one of the hospitals we've worked with in the past by replacing their old air handlers would be too easy. We knew they have issues they are still working out. What about a first-class hospital? One with high tech surgery suites with hundreds of patient beds? What kind of germs were hiding there? So we set out to get permission from one of the largest hospitals in the United States (whose name shall remain anonymous as part of our agreement). After speaking with their facilities, nursing and legal department, we got the "go ahead" to take samples from one of their air handlers. Now, this hospital is huge. It's a sprawling complex in a major metropolitan area. It has orthopedic specialists, heart surgeons, brain surgeons, a maternity ward and of course a huge outpatient surgery center. Of all the hospitals in the country, and perhaps the world, surely this one would be contaminant-free! Which air conditioner should we choose? Which one do you think would be the cleanest? 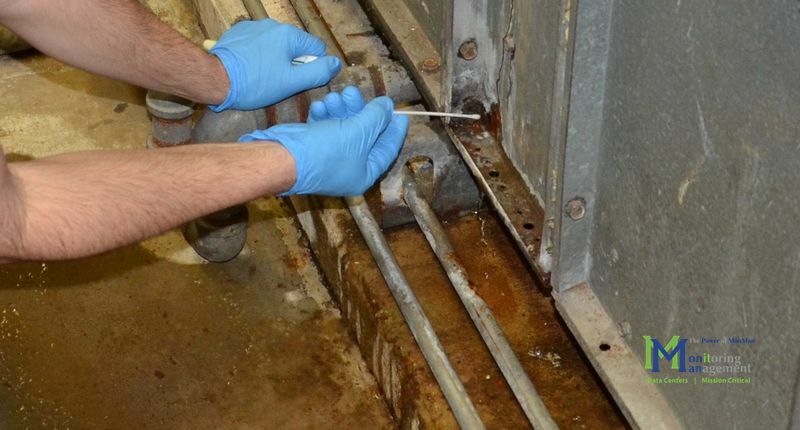 We decided to take samples from an air handler serving an operating room that handles cases from back surgery, appendicitis and even heart surgery. If any air conditioner should be clean, surely it would be this one! The specifics of our study can be found here. But in short, we took samples at over ten points in the air handling system. We took bacterial and mold samples from the air coming back from the operating room, samples inside the unit itself, and of course, samples of the air heading back into the OR. (Note: We scheduled the sampling during a downtime, while no patients were in the operating room, so no one was at any risk). Out of 10 sample points, every single one showed microbial contamination of some type. Every sample point was contaminated with either bacteria, mold, or both. Now, we live in a world filled with germs. They are all around us, and are unavoidable. But the types of contamination, and where we found them worries us. 1) Alcaligenes faecalis: As its name implies, it was first discovered in feces. It's scary to know it's living inside an air conditioning unit. It's actually a fairly harmless bacteria, but it can cause urinary tract infections. And besides, found in feces? Gross. 4) Methylobacterium mesophilicum: This is one of the two most commonly found bacteria in clinical samples. It is especially mean to immuno-compromised patients, like those found in a hospital operating room. If you'd like to know more about our study, the techniques we used and for much more detailed information, please see the technical post that accompanies this article.